Zebra is sponsoring the Ertz Family Foundation’s City of Love Event and Auction Fundraiser at Lincoln Financial Field in Philadelphia on Nov. 29, 2018. The foundation’s three pillars of service are youth sports, education and family. The Ertz Family Foundation has announced that Zebra Technologies Corporation is the presenting sponsor of its “City of Love Event and Auction Fundraiser.” Proceeds from the event will benefit local Philadelphia area charities that align with the foundation’s three pillars: youth sports, education and family enrichment. The City of Love Event and Auction Fundraiser presented by Zebra Technologies will take place at Lincoln Financial Field on Nov. 29, 2018. The Ertz Family Foundation’s founders, World Champion sports couple, Zach and Julie Ertz, will attend the inaugural event and to announce the foundation’s City of Love Fund. Zach Ertz, tight end for the Philadelphia Eagles, and Julie Ertz, defender for the U.S. Women’s National Soccer Team, created the Ertz Family Foundation to help people in need after Zach returned from a “life-changing” visit to Haiti. The Ertz Family Foundation’s three pillars of service are cultivating values in children through sports, improving the quality of education, and restoring hope and building communities. The foundation executes on these pillars in many ways like helping replace a high school football team’s stolen equipment, creating a scholarship program in Haiti and supporting a college prep program for aspiring students. The Ertz Family Foundation and Zebra share a commitment to investing in education. The foundation seeks to provide educational opportunities for youth of all ages, and Zebra provides talent and resources to create alliances with education-focused organizations. 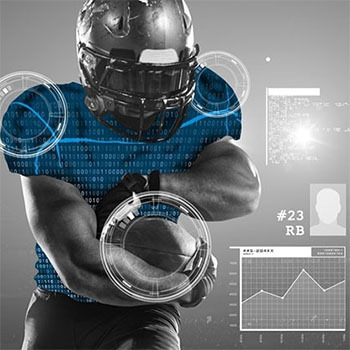 As the “Official On-Field Player Tracking Provider” for the NFL, Zebra also helps those on the front line of football operations and on the field of play. The Zebra MotionWorks® Sport solution leverages the same tracking and location solutions technology that Zebra implements globally to give visibility to an organization’s assets, people and transactions.